Snøhetta Reindeer Pavilion: a contribution to preserving Europe’s last wild reindeer herds. Norway manages the only remaining populations of wild European tundra reindeer in 23 more or less separate mountain areas in Southern Norway, which means that it has a unique international responsibility to secure them for the future. The Norwegian Wild Reindeer Foundation, founded in 2006, has two Wild Reindeer Centres: one in the south at Skinnarbu, nearby in the village of Rjukan and one in the north, in Hjerkinn. The foundation has as its main purpose the preservation of the wild reindeer areas for the last reindeer herds in Europe. The foundation was a local initiative, taken by environmentally involved people and politicians. Both areas wanted a Norwegian Wild Reindeer Centre, to preserve the areas from outside interventions, like building roads through the reindeer areas. Heidi Ydse, who is a nature interpreter working for the Norwegian Nature Inspectorate, is closely involved in the running of the northern Wild Reindeer Centre, owned by the Wild Reindeer Foundation. The Norwegian Wild Reindeer Centre Pavilion in the north (see photo at the top) with its strikingly modern clean lines is situated near the village of Hjerkinn on the outskirts of Dovrefjell National Park in central Norway, overlooking the Snøhetta mountain massif. The 90m2 building is open to the public and serves as an observation pavilion for the Wild Reindeer Foundation and offers educational programmes. A 1,5 km nature path brings visitors to this spectacular site, 1200 metres above sea level. The reindeer have always survived in this harsh climate, for more than 40,000 years. Picture of a pitfall the way they are found in the mountains today. Used for trapping wild reindeer during the stone age and up to the middle age. Photo: Espen Rusten, SNO. Heidi enthuses: "I love doing this job. It is important for Norway - and it is an international commitment - to take care of the European wild reindeer and the values it represents. We have to teach the public why we must take care of nature and how to do it and at the same time enjoy nature for its own good. We have to teach them about wildlife, about the importance of keeping the reindeer populations in balance. So I take people out, and I show them a pitfall for example, where human beings used to trap and kill wild reindeer 2000 or 3000 years ago. The Norwegians still hunt these reindeer, it is a part of our legacy and also part of our cultural heritage. So we manage the populations, by hunting them still one month a year. Between 4,000 and 5,000 wild reindeer are taken out each year during the hunting season. The number varies according to the population figures in the wild reindeer areas." "There are important threats towards wildlife in the world." Heidi explains, "There are important threats towards biodiversity in the world. We must inform the public and stop the area fragmentation by human interventions, because the reindeer is a migrating species. The reindeer migrate from summer pastures to winter pastures. Areas where the snow conditions are very different and the amount of lichen, the most popular organism for the reindeer, is sufficient for winter survival of the whole reindeer population. The building of a mainroad in a wild reindeer area, disturbs their way of living and disturbs their possibilities to migrate. When people want to have a new road in these reindeer areas, build new huts or mountain lodges, and integrate all kinds of infrastructure or plan to build for example a hydroelectric power dam that forms an enormous threat to the reindeer, because suddenly these animals lose a bit of their mountainous area. Their living area is being fragmented." All these human interventions are obviously a threat to the last remaining reindeer herds. Heidi Ydse, who is a biologist, says, "The human intervention in nature is actually one of the most threatening points for wildlife in the world. That is one of the thoughts behind the initiative of founding the Wild Reindeer Centres. People wanted to preserve the Wild Reindeer Areas as a part of our culture and as a part of our history and to preserve the species. In Norway there are the last European remaining reindeer. We have some smaller areas, which had only down to 50 animals. And that is not sustainable in the long term. But we also have large areas, where thousands of wild reindeer are still found." "In order to keep the reindeer population in balance, human beings have to play the role of carnivores." "It is important that the ecosystem has to be kept in balance," Heidi says. "We have taken the task of the carnivores, the meat-eaters, of what they did in former times. Since we don't have golden eagles, lynxes, wolves or wolverines anymore in mountainous areas to keep the populations of the wild reindeer down, we have one month per year a hunting period, to keep the number of reindeer down. The role of the reindeer is very important in the ecosystem, because they are large herbivores (grass-eaters) in an alpine landscape. The reindeer are eating grass and lichen, even when it is underneath the snow. Actually, the reindeer is the only animal, which can get nutrition out of the lichen." 130 years ago the populations of wild reindeer had 4 large regions to migrate within. Heidi Ydse explains, "These four regions have now been split up into 23 smaller areas. 130 years ago they had enough space to move about, they had the whole mountainous areas in the southern part of Norway. So the area for the reindeer was a lot bigger then, but now we have shrunk that area down to 23 smaller areas. We had to protect the wild reindeer from 1902 till 1906 and in the period from 1931-1938, because they were almost eradicated. So we stopped hunting them during those periods. Later on, the population increased sufficently, and the hunt started again. But we still protect them most of the year, we have a hunting period, which is 1 month in the autumn and we have a quota, a certain number is allowed to be taken out during the hunt. The quota is adapted to the number of animals in each area. We need to have a sustainable management for the wild reindeer hunt within each area, so that not too many of them are going to be killled or too few, beacause you have to keep a balance. Because the alpine ecosystem is not intact anymore, the humans have to play the role of the carnivores." "The wild reindeer is a migratory species, and they need large areas to roam. We are trying to preserve the mountain areas. The wild reindeer are on the move all the time. In order to follow them closely, and to get more knowledge about the reindeer and their usage, some reindeer wear radio collars around their necks. In that sense we can track them and follow them on GPS. Some of the radio collars are also connected with cameras which take pictures every three hours or so. The pictures show the everyday life of the wild reindeer, in snowy weather, in rainy weather, in sunny weather, when they are laying down for instant, but you can also follow them when they migrate. Finland has some forest reindeer, but in Norway we have the last remaining of the European tundra reindeer." “The reindeer need to gain body weight during summer time, to survive the winter. During the last Ice Age Norway was covered by snow and ice, and the reindeer were living in the Central Part of Europe or in the Eastern Part of Russia. When the last Ice Age ended, and the ice cap retracted, the reindeer followed, so they migrated north and west. And finally they settled down in Norway." “I am a hunter myself, and so is my husband. Hunting is necessary, if we wouldn't hunt the population would increase too much and we would have a population disaster. In the 1950s we had an overpopulation of wild reindeer, the first in modern times in Norway. Many animals starved to death and after that, population regulation by hunt has been crucial to maintain a healthy population, in balance with the food resources." When we talk about big game, we talk about large wild animals. Big games are large animals, which are more demanding to manage. Especailly the reindeer needs large areas and since they can't have those areas anymore, because men intruded in these areas, we need to keep the populations down. If not, we would have animals starving to death like we did in the 1950s. The population would increase into a very high level." "The real threat for the reindeer is the climate change. Warmer weather, warmer winters, where we also have more rain during winter, and where we have more storms, with wet snow, with more humidity and hotter summers, that all forms a real threat to the wild reindeer. In hot summers days the reindeer try to find cold areas like snow patches or glaciers to cool down and also to avoid parasites like the warble fly or nose fly. By doing so, they lose time to gain weight, and that will reduce their body conditions before the winter. If the winter is wet and humid and if there is ice covering the pastures, the animals will get skinnier and that can lead to more animals dying of starvation. That is a huge challenge for the reindeer and the wild reindeer management. We need to maintain the habitats they have, so they can migrate to pastures that are accessible. Norway is proud to have preserved the last European herds of wild tundra reindeer. In Norway we also have about 200,000 semi-domesticated reindeer, which are owned and run by the Sami people, the indigenous people in Norway, while we have some 30,000 wild tundra reindeer. 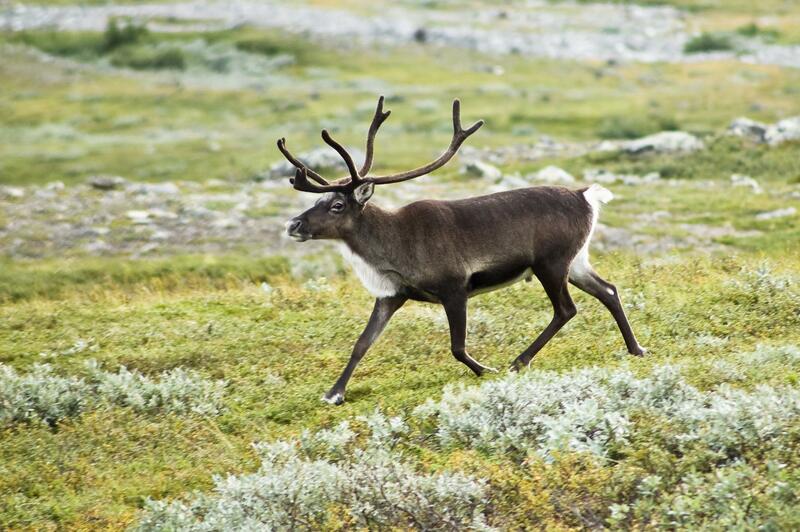 The semi-domesticated reindeer are not being hunted, but run in an old Sami cultural way. They are owned by the Sami, and the don't migrate freely, they are being controlled by humans in their area use. But they are nevertheless also part of the cultural history of the Sami people." "I have fallen in love with the reindeer." “The reindeer are really fantastic animals, they are beautiful. It is lovely to see them walking in the mountain areas, to see them lay down in their pastures and to just relax, in nice weather, and to see how well adapted they are to the climate and to this harsh environment. I am really amazed. I have fallen in love with the reindeer a long time ago." For further information please visit: www.villrein.no.